Contact is the title of a science fiction novel written by Carl Sagan in 1985 and adapted for film by he and his wife Ann Druyan. 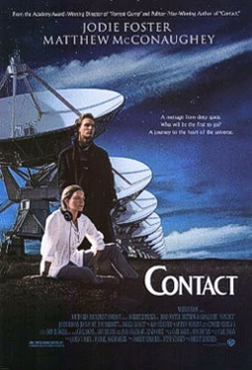 Released in 1997 as a major motion picture, Contact tells the tale of SETI scientists using the VLA in New Mexico USA who pick up an ACOM signal that provides instructions on how to build an alien transportation device. The project is fraught with debate and sabotage, but is eventually completed. The cinematic effects were excellent at the time. It won the Hugo Award for Best Dramatic Presentation. Jodie Foster was also named Best Actress by The Academy of Science Fiction, Fantasy and Horror Films. Unfortunately the plot avoids serious ufology altogether. There are no characters akin to Claude LaCombe, the character in Close Encounters of the Third Kind, patterned after astronomer Jacques Vallée. Instead, the topic is touched on peripherally and disparagingly in the form of UFO nuts and cultists; something that Sagan's friends at CSICOP likely found deserving of added applause. Somewhat ironically however, religion was portrayed as respectable. The wishy-washyness of this deepens further when we consider that during an interview with broadcast journalist Charlie Rose on July 18, 1997, Druyan reported that neither she nor her husband Carl believed in an afterlife. But it gets even worse. Only a short time later in the same interview she says that a religious experience was very much what they had in mind for Contact, and went on to say, "This is about the search for God" and also described its theme as a, "coming together of science and that religious impulse". How are we to reconcile these contradictory points of view? One way would be to take into account that almost two-thirds of the scientists asked in a poll said they believe in God. At the same time, UFOs have remained consistently taboo in scientific circles. So by including religion as a major theme, it was a safe bet that the film would appeal to a wide audience without alienating the majority of Sagan's peers in the scientific community. The tragedy here is that Sagan missed his chance to express his repressed interest in UFOs. Most people are only aware of Carl Sagan the astronomer and skeptic. Fewer are aware that he was involved on both sides of official investigations into UFO phenomenon. During the 1950s he defended the idea that some UFOs were extraterrestrial visitors. In 1966, he was a member of the O'Brien Committee, also known as the USAF Scientific Advisory Board Ad Hoc Committee to Review Project Blue Book. The O'Brien Committee recommended the creation of university-based study groups that would provide scientific support for Project Blue Book investigators. As Sagan became further embedded in the scientific establishment, he was pressured by his piers, among them Edward Condon into a harder stance on UFOs. Later Sagan would become a prominent member of CSICOP, and the group would triumphantly espouse him as their own particular brand of convert. But even as a member of CSICOP, Sagan always came across as "the good cop", and his manner of delivery suggested he knew more than he was letting on. There are some significant parallels between SETI and ufology that Contact failed to portray. In the movie, SETI scientists receive an alien message through their radio telescope . Similarly, real UFOs have been tracked on RADAR . In the movie Contact, the main character is transported to an alien world where she communicates with an alien intelligence, yet she is unable to secure any proof that the experience actually happened. Similarly, real-life UFO witnesses and investigators know that what they experienced is real, yet the only ones who can truly empathize with them are those who have been through the same process. Real scientists have worked on both real life SETI projects and real life UFO projects, including Carl Sagan himself.